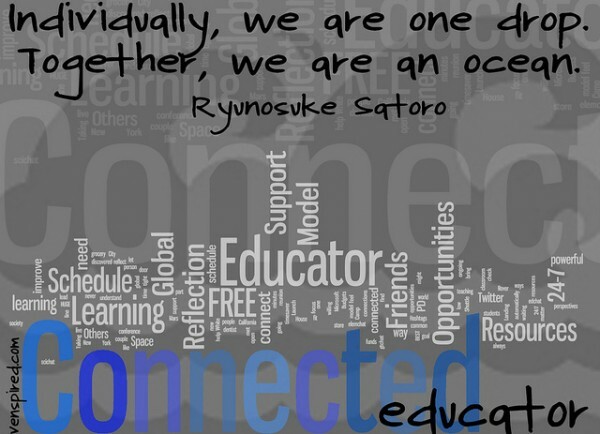 I consider myself pretty invested in the Connected Learning community. I had the privilege of co-chairing the “Civic Education and Youth Serving Organizations” strand of the Digital Media and Learning conference in 2013, I contributed to an eBook edited by Antero Garcia focused on the application of Connected Learning principles to the classroom, and I am a Connected Learning Ambassador for the National Writing Project. Nonetheless, whenever I prepare to talk about Connected Learning with classroom teachers, as I did last week during a workshop with the UCLA Writing Project, I find myself a bit uneasy about using the actual term. I suppose that this sense of unease stems from my memory of what it was like to attend professional development sessions about new models of teaching and learning — project-based learning, student-centered learning, direct instruction, etc. — when I was a classroom teacher. Too often, these models with catchy names were presented as if they were pre-packaged, complete ways of doing things that you had to adopt hook, line, and sinker in order to do them ‘right,’ in the process throwing out every lesson plan you’d ever developed before learning about said model. Teachers know that the classroom is a complex ecosystem and that they constantly draw from the best of various models at any given moment in their teaching in order to tailor instruction to the needs of their students; plus, many models overlap to the point that teachers could be adhering to several of them simultaneously. And, so, as I set out to talk about Connected Learning with educators, I kept wishing that it didn’t have a name that sounded so impressive and self-contained, and instead could just be called, A Vision for Learning that Encompasses Many of the Best Practices You Already Implement in Your Classroom but Maybe Introduces You to Some New Strategies. Not as catchy, but more accurate. Regardless, I think that it is critical to discuss the principles of Connected Learning with classroom teachers since the model often gravitates to informal learning spaces in order to avoid the constraints of classroom learning. As Antero Garcia notes in the introduction to the aforementioned eBook, “Teaching in the Connected Learning Classroom”: “While connected learning principles are seen flourishing in out-of- school spaces, there are fewer articulations of how connected learning can help inspire and shift existing teacher practices” (p. 6). The National Writing Project believes that teachers of writing must be given the opportunity to write themselves, so I began my 90 minutes with these 16 educators by asking them to consider a quote by Herman Melville (“A thousand fibers connect us with our fellow men…”) and respond to the following prompt: “What does it mean to be connected? Who/what are you connected to?” I found it useful to stress the importance of connections in our own lives as a springboard for thinking about the crucial importance of connections in creating powerful learning experiences for young people. To be connected means sharing a common experience, a thought or feeling. I am connected to physical things like members of my family, friends and colleagues but I am also connected to intangible things like feelings and emotions that could either be felt by my or shared with another person. Not like Facebook connected but really connected. Being connected means to be interrelated and independent. You are connected to family because they help you and vice versa. You are related to each person differently but yet still a family. It means that nothing is isolated or alone. Nothing exists or came into being on its own. I used these pieces of writing to transition into an exploration of Connected Learning as defined by the Connected Learning Alliance itself, stressing the fact that they had already discovered its essence through their writing. Because I know that in any room of teachers, you will find huge variation in comfort with technology, I wanted to highlight the point that Connected Learning is not about the “shiny devices” as my fellow Connected Learning Ambassador Bud Hunt puts it, but about the learner — devices simply give us a new set of tools that we can use to facilitate the connection that we want to encourage between young people. I shared a clip from a documentary film that a group of students made as part of the UCLA Council of Youth Research, an after-school program that I coordinate, in order to start a discussion about the kinds of connections that the teachers saw students making as they pursued this interest- and purpose-driven research project. This clip brought us straight to the heart of the matter — it was an example of Connected Learning that could easily be written off by teachers as, yes, amazing work, but the kind of amazing work that could only be done with the freedoms that come in an after-school program. In order for students to make their documentary about learning conditions in California schools 10 years after the filing of the Williams v. California case, those of us who ran the program had to drive them to pre-arranged interview locations and to field sites in order for them to gather data, give them hours and days to mess around with film editing software, and allow their learning to be dictated by the questions they decided upon. I put all of this out on the table with the teachers to let them know that it’s OK to talk about the institutional, instructional, and personal constraints that we experience in schools that make it difficult to integrate as many elements of Connected Learning that we might like into our classrooms. It is only through talking through the barriers that we can share ways to overcome them. I shared my journey of trying to take the teaching and learning model that I used in the UCLA Council of Youth Research back into an 11th-grade English classroom, and then encouraged teachers to review an infographic explaining the six principles of Connected Learning and share the principles that they found most difficult to integrate into their practice. After all, many of the teachers in the room were already tapping into student interests and working to give their academic instruction a sense of shared purpose. I wanted them to focus on the principles that they could not easily find ways to incorporate into their teaching. Importantly, the teachers did not list these barriers as a way of opting out of integrating more Connected Learning principles into their instruction; instead, they voiced the barriers as the first step to finding ways to skirt or overcome them. I find it crucially important to get these issues out on the table and for the Connected Learning community to take them seriously as they continue to work with teachers and schools. Our workshop concluded in a way that I hope Mimi Ito will appreciate — we hung out sharing strategies, messed around with developing unit plans for the upcoming school year that were more connected, and geeked out with the new media site, Popplet, which allowed teachers to create mind maps while adding a new tool to their repertoires. Check out some of the Popplets below (all works in progress, of course) and consider ways that you can help support classroom teachers as they strive to make their work more connected. For more examples of Connected Learning in action in classrooms, download the “Teaching in the Connected Learning Classroom” eBook for free. This post was origially published to DMLCentral, and you can find the original article here.